Julia Hurlbut of Morristown, New Jersey, became involved in the suffrage movement around 1915. Identifying with the radical wing of the movement, she served as Vice President of the New Jersey branch of the Congressional Union for Woman’s Suffrage and as a delegate to the National Congressional Union Conference. In 1916, she was one of the envoys that went to the suffrage states in the west to call for a meeting in Chicago in June to form the National Woman’s Party (NWP). In court on July 17, Judge Mullowney sentenced the 16 women to 60 days in the Occoquan Workhouse on the charge of “obstructing traffic.” This group of suffragists was pardoned by President Wilson after serving three days. His action may have resulted from visits to the President by husbands who saw their wives in prison. One was the husband of Mrs. J.A. H. Hopkins, who had been a member of the Democratic National Campaign Committee in 1916. 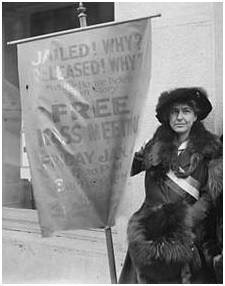 After the arrest and brief imprisonment, Julia Hurlbut spent several months speaking in New Jersey on behalf of woman suffrage. She also served her country during World War 1. Source: Morris County New Jersey Heritage Commission, http://morriscountynj.gov/MCHC/exhibits/women/, viewed on 1/26/2014. Irwin, Up Hill with Banners Flying, p 154, 232.